for another Clean and Simple card. I wanted to create a painted effect today, so I used a combo of watercolor pencils and Tombow markers on the butterfly, then gently painted with my watercolor brush. For the background piece, I used watercolor crayons, again blended with my watercolor brush. 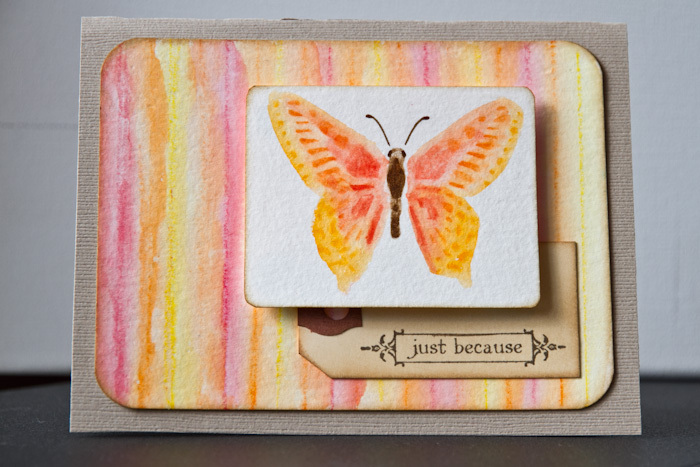 Add some Tim Holtz distress inks for stamping and borders, and it's done! What a great idea Joyelle, I look forward to seeing what you decide to try next. Beautiful colorway too! Joyelle this card is lovely. The watercolor effect with the tombows was a great idea. Thanks for playing along with dreamweaver stencils. soooo pretty. GReat colors and LOVE the Tombows! Okay, so how did I NOT try this myself! You know I ADORE my Tombows!! And I'm going to have to scraplift your Idea Joyelle...uh...if you don't mind, wink. I love peeking into your playroom, so I hope you keep posting! This is very lovely. The watercolor look is fantastic. Great job with the stencils.